Azure Redis Cache is based on Redis Cache. Redis cache is an open source, in-memory database that is used for improving the performance of an application by retrieving and storing the data in Redis cache using Key-value format. In this article, we will learn step-by-step how to use Azure Redis Cache in Azure. Azure Redis Cache is based on open source, in-memory Redis Cache that allows Web apps to bring data from a backend data source into cache and server Web pages from the cache to improve app performance. 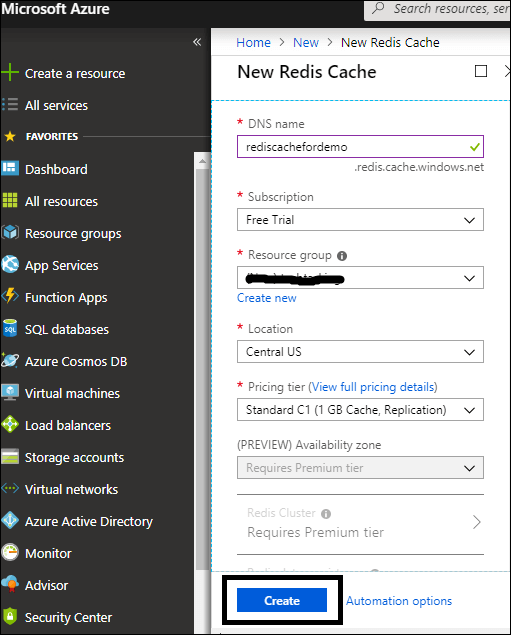 In this step by step tutorial, we will learn how to use Azure Redis Cache in our Web app. Modern applications mostly work with a large amount of data. In this scenario, when you retrieve data from a database, it typically finds the table and gets the results that it sends back to the user. The performance, in such case, goes down due to multiple requests. So, to reduce some number of requests, you can use cache data that does not change frequently. Redis Cache is an open source, in-memory database that is used for improving the performance of an application by retrieving and storing the data in the cache memory using a Key-value format. Azure Redis Cache is a feature-rich functionality that gives you access to secure, low-latency, high-performance throughput. Let’s start Redis Cache implementation with C#. 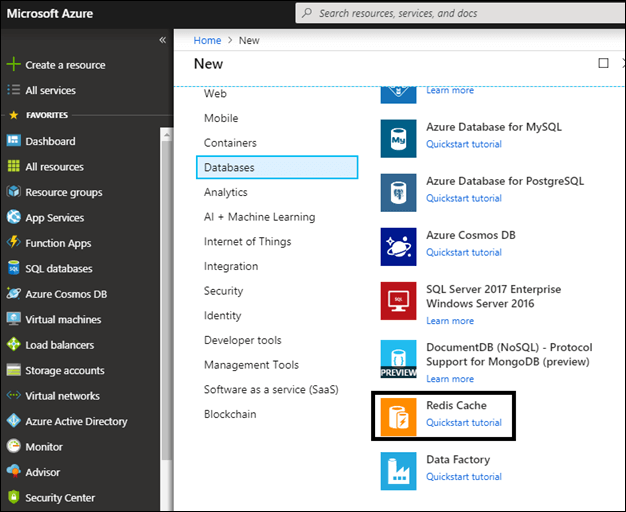 Log into Azure port, go to Databases >> Redis Cache. Create a news Redis Cache. 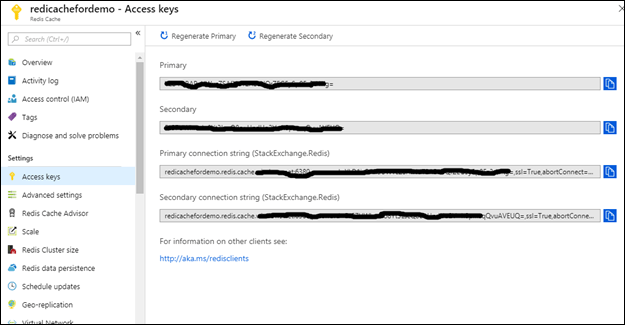 Get the Access Keys to connect with the newly created Redis Cache. Install the StackExchange.Redis NuGet package using the following command. Let’s start coding to store the data into Redis Cache and retrieve the data from Redis Cache. We had recently seen the code of Azure Document DB CRUD operations. If you have not read it yet, click on Azure Document DB CRUD Operation and read. We have the code of CRUD operations in Document DB. Now, we will implement Redis Cache here. Similar to the previous article, we need to add Redis Cache connection string into the appsettings.dev.json file. Now, add one more property RedisCache into Config.cs that will get the value of Redis Cache connection string from appsettings.dev.json. Let’s come to the program.cs file and add ConnectionMultiplexer for Redis Cache. Now, we will store a document into Redis Cache on the basis of Key while creating a document into Document DB and while reading this document, we will use the Key to check if the document is present in Redis Cache or not. We will skip reading the document further from Document DB. By doing this, we can increase the performance of the application. //Set JObject into redis cache with key "redisEmp3"
Instead, let us read the document from Redis Cache. //Read document from Redis Cache . The below snapshot shows how we read a document from Redis Cache. The following is the whole code of the Program.cs class. I hope this article will help you!